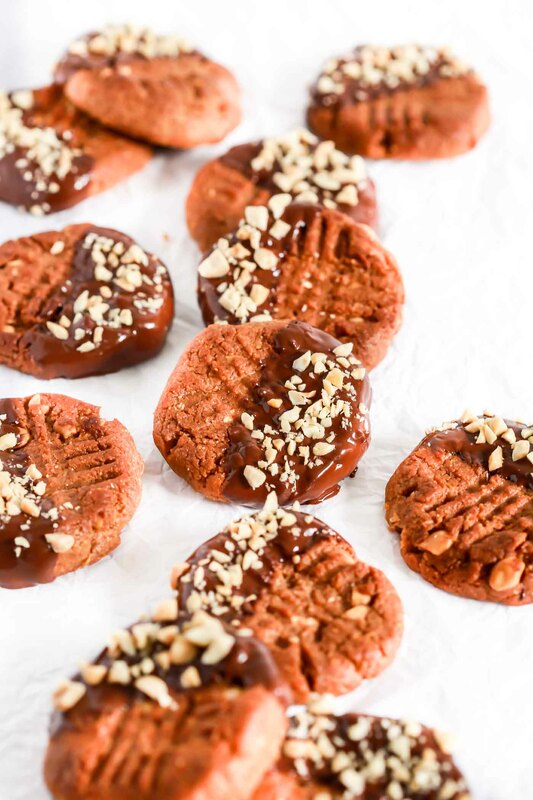 Delicious low-carb peanut butter cookies, using creamy peanut butter, natural sweetener and topping with sugar-free chocolate and chopped peanuts. Are you obsessed with cookies, but feel guilt every time you eat some? I think I have a good solution for you. These low-carb peanut butter cookies are delicious, sugar-free, gluten-free, satisfying and super easy to make too. You will prepare them in 10 minutes and bake for about 15 minutes. Also this recipe requires only 6 ingredients that I bet you probably already have in your kitchen. 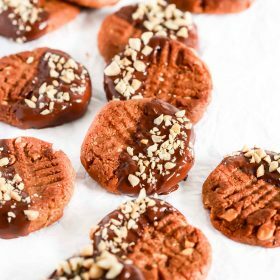 These low-carb peanut butter cookies are definitely the best cookie recipe to make when your cookie cravings come on. 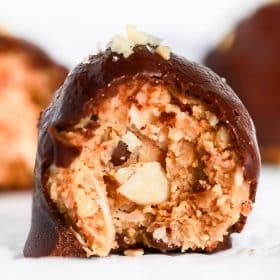 It’s a super basic recipe, but yet very elegant with the melted chocolate and the chopped peanuts on top of it. It is an excellent cookie recipe to give to someone as Christmas gift too. 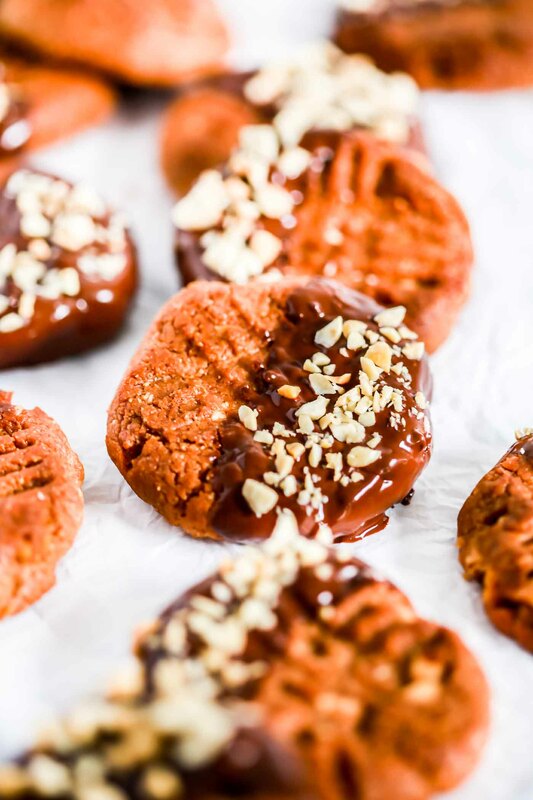 These Low-carb Peanut Butter Cookies are made with soft peanut butter, but you can substitute smooth peanut butter for chunky to get a different cookie texture. Yum! I only baked these cookies for 15 minutes, but feel free to bake them a minute or two longer to obtain a little crunch. But I think that the softness is what makes them so good. These cookies are gluten-free because there is no flour in and they are made with natural sweetener and sugar-free chocolate and that’s why they are also low-carb. But you can make them with any other type of sugar such as coconut sugar, white sugar or brown sugar. 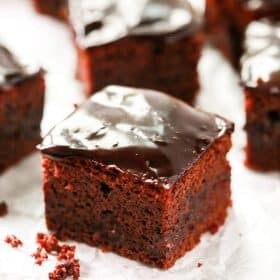 The chocolate on top is also sugar-free, but you can use a dark chocolate or even milk chocolate even if you don’t want to make them low-carb. It’s totally up to you. Enjoy! Preheat the oven to 350F. Line a baking sheet with parchment paper or silicone mat. Set aside. In a large bowl add the peanut butter, eggs, sweetener, vanilla, and salt. Using a spatula stir everything well until all is combined and the dough is smooth. Add the chopped peanuts and mix well. Roll balls of dough. It’s about 1.5 tablespoons of dough per cookie. Place 2 inches apart on the baking sheets. Press fork into the tops to create the criss-cross pattern. Probably the dough will crack a little when you press your thumb into it. You just have to re-seal some cracks by simply smooth it out with your fingers. But know that it’s totally fine to have a few cracks. Bake for about 15-20 minutes, until very lightly golden. Allow the cookies to cool completely before handling. While the cookies are in the oven, melt the chocolate in the microwave. In a microwave-safe bowl, melt ¾ cup chocolate chips. Heat for 1 minute. Remove from the microwave and stir. Return it to the microwave and repeat, stopping to stir every 15-seconds until the mixture is totally melted. To make chocolate-dipped cookies, dip half of cookie into the melted chocolate and let the excess run off. Sprinkle with peanuts, if desired. And if you like this Low-Carb Peanut Butter Cookies recipe, please share with your friends and family. Do you wanna taste more? Subscribe to my newsletter and follow Primavera Kitchen on Twitter, Pinterest, Google +, Instagram and Facebook for all delicious recipes updates. As always, you are really appreciated for stopping by. 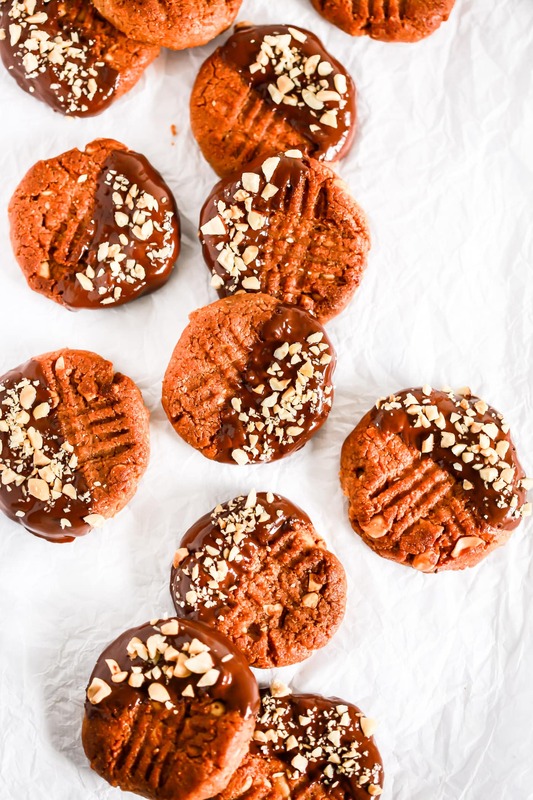 Guilt-free cookies sound perfect… Especially since they involve peanut butter!! How much xylitol does this need? It’s 1/2 cup. I just adjusted the recipe to clear further confusion. Thanks for pointing it out! You said we can also use white,brown,coconut sugar, Is it also possible to use liquid sweetener like honey/molasses? If so How much would you recommend? Or is it best to use mix of one of the granulated one and liquid one? The ratio would be half to half or should I change differently? And If I want to reduce the amount of sugar is it possible? Yes, it’s possible to reduce the amount of sugar in half. However I am not sure if this recipe would work with honey or molasses, since I’ve never made this recipe with those items. Sorry about that. But I believe it would work.